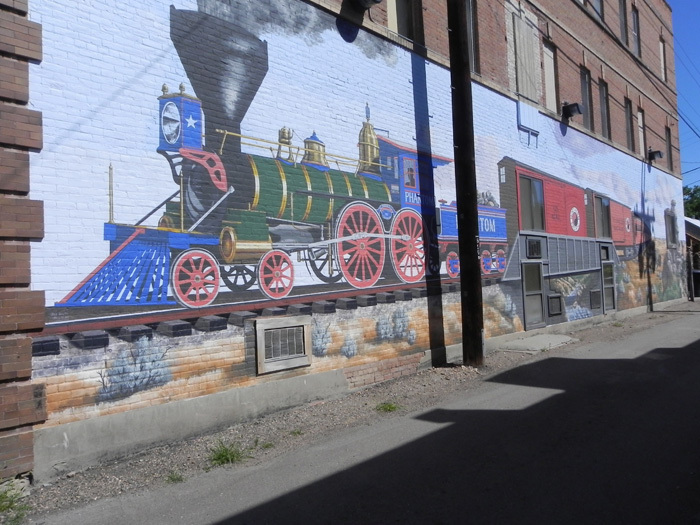 Forsyth’s first gigantic art mural by artist Bob Watts relates to a time when the town took roots encouraged by the railroad. It portrays one of the first steam locomotive trains to come through the area on its way to the west coast. At last the connection was made from the east coast to the west. The locomotive was built in Tounton, Mass. in 1857 by the Wm. Mason & Co. builders. The railroad was the biggest thing in the county at that time and a highly competitive business. They advertised their locomotives by elaborate coloring and brass work. This allows the artist to capture the true beauty of the iron giants. The entire summer of 2006 was spent on this creation. It was painted on the outside of the 100 year old Royal Oaks Inn, the housing for railroad workers. The surrounding landscape depicts the western plains and includes two buffalo in the detailed foreground. They would rather be anywhere else than where such a smoking noisy creature rattled along on their prairie land.